As diet foods go, rice isn’t ideal because it has a relatively high energy density. That means it packs a significant number of calories into a moderate serving size and doesn’t always offer the fiber, lean protein or water content necessary to keep you full for long periods. However, if you manage to keep your daily calorie intake moderate, you can eat rice often and still stay at a healthy weight. Rice is a grain, one of the five primary groups in the USDA’s food pyramid. Grains tend to contain more calories per serving than other natural foods in the pyramid, such as fruits, vegetables, low-fat dairy products and lean proteins. However, they also offer nutrients that the other groups don’t. In particular, brown rice, black rice and wild rice are whole grains that can help deliver healthy amounts of dietary fiber, B vitamins, folate and minerals, including magnesium and selenium. The amount of weight you lose or gain depends on the number of calories you take in versus the number that you burn. If eating rice every day means that you’re consuming more calories than you burn through physical activity, even by just a slight amount, you will put on weight over time. The rice itself is not responsible, however, since the same phenomenon would take place no matter what you ate, as long as you continued to build up a calorie excess. The U.S. Department of Agriculture reports that a cup of cooked white rice has about 240 calories, 4.5 g protein, 0.5 g fat, 53 g carbohydrates and 0.5 g fiber. In contrast, a cup of cooked brown rice has approximately 220 calories, 4.5 g protein, 1.5 g fat, 46 g carbohydrates and 3.5 g fiber. Wild rice may offer the most nutrients per calorie value, with about 165 calories, 6.5 g protein, 0.5 g fat, 35 g carbohydrates and 3 g fiber per 1-cup serving. 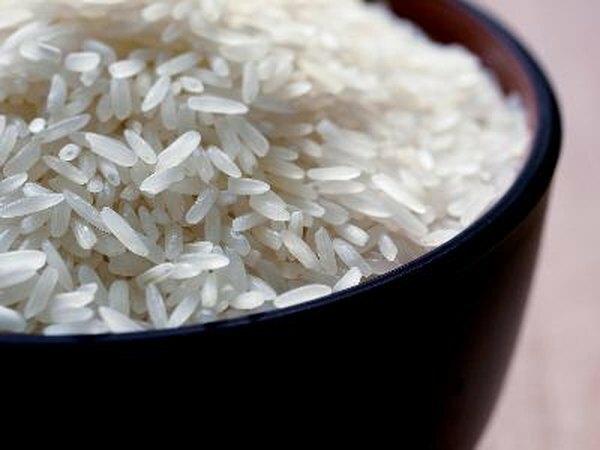 If rice is a staple part of your diet, there are a couple measures you can take to ensure it doesn’t cause you to pack on the pounds. First, dish out smaller amounts and round out your meals with fruits and vegetables, which contain far fewer calories per serving. You can also eat brown, black or wild rice instead of white rice whenever possible. Whole grain varieties offer about the same number of calories but more fiber and protein per serving, so they’re likely to keep you full for longer periods. If you’re concerned about how the rice you’re eating or your diet in general is affecting your ability to maintain a healthy weight, speak with your physician or a registered dietitian. MyPyramid.gov: Why Is It Important to Eat Grains, Especially Whole Grains?